Originally created to replace stacks of wooden-bodied molding and joinery planes, combination planes are defined by their flexibility. Stanley boasted that their #45 was seven planes in one. And, although the Stanley #45 remains a beautiful example of ornate Victorian metalwork, it is nevertheless not the easiest plane to set up or use. 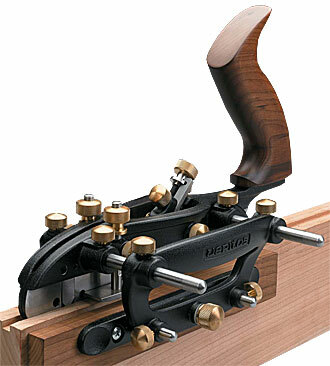 Despite its historical shortcomings, a combination plane is favored by those who prefer a quieter workshop experience. Invaluable for restoration work, it is also an ideal choice for times when you need to make a short run of custom molding. It is for those reasons that Veritas resolved to refine the Stanley #45 into a combination plane that is precisely machined, easy to adjust and holds settings securely – all features that, together with the improved blade technology, also make it fully reliable in use. The Veritas Combination Plane is the result of four years of research and development. The redesign of the combination plane incorporates ductile cast iron plane bodies that are produced using the shell mold casting process. As compared to sand casting, this process yields better detail and dimensional accuracy, superior surface finish and improved machining qualities. 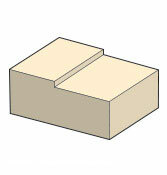 While combination planes are defined by their flexibility, they are not complex to use and are often faster to set up than a machine for one-off work. 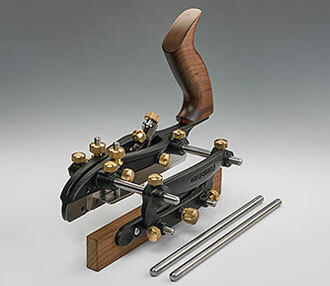 The Veritas combination plane was designed from the ground up to eliminate problems that made the original Record and Stanley planes frustrating to use. It is precisely machined, quick to adjust and holds settings securely, making it reliable in use. 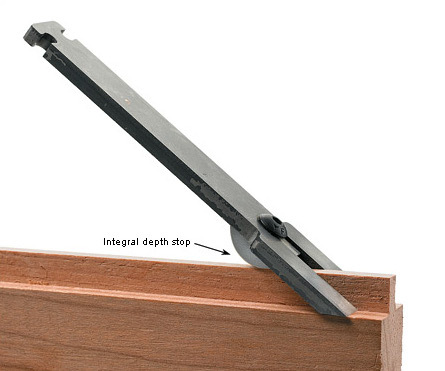 With straight cutters used in conjunction with the fence, it can tackle fundamental joinery such as rabbets, tongues and grooves, and with the addition of a shop-made batten, the plane can also be used to cut through-dadoes. 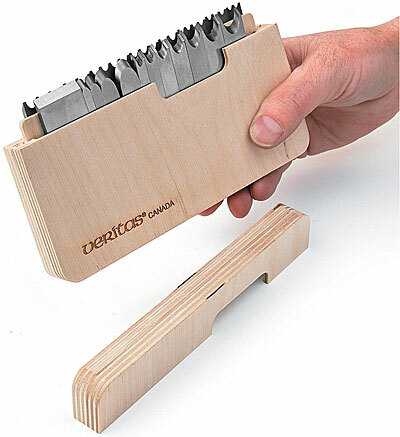 The two-part design of the plane, with a main body and a separate sliding section, lets you accommodate blades of different shapes and sizes to make cuts ranging from grooves as narrow as 3.2 mm (1/8 inch) up to 25.4 mm (1 inch) wide rabbets. 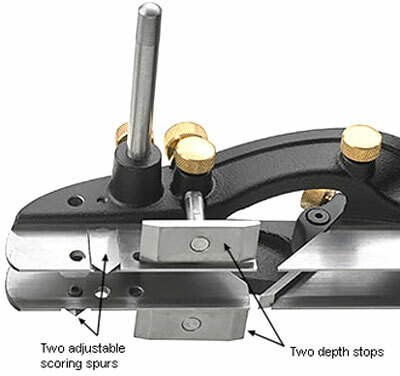 To prevent tear-out in cross-grain work, adjustable scoring spurs on both the main body and sliding section define the edges of the cut ahead of the blade. 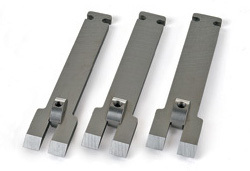 The sliding section adds stability and support to the blade, and clamps securely in place on stainless-steel rods. 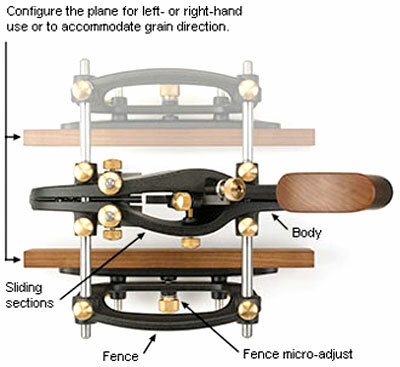 The fence can be positioned on either side of the plane, allowing you to configure the plane for left- or right-hand use to suit your dominant hand or accommodate grain direction. 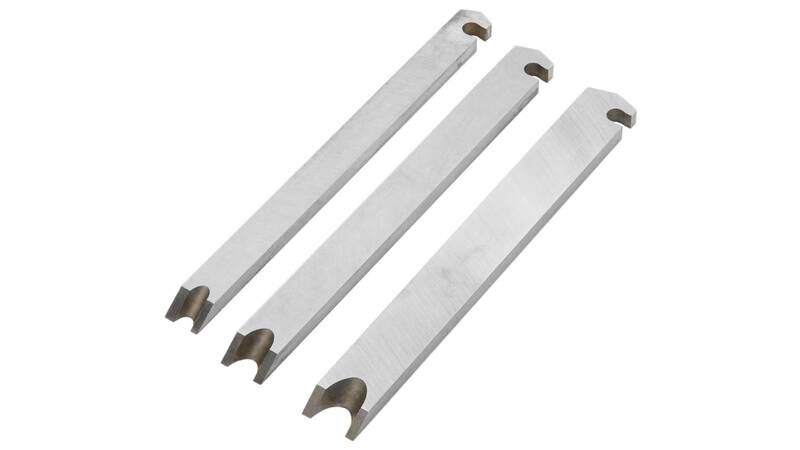 Two pairs of rods are included, 127 mm (5 inch) and 203 mm (8 inch) long, letting you make cuts reaching up to 127 mm (5 inch) from the edge of the workpiece. After locking the fence in place, you can fine-tune the position of the torrefied maple face with a micro-adjust thumbscrew. The depth stops on the body and sliding section also have threaded adjustment, making set-up faster and more precise. 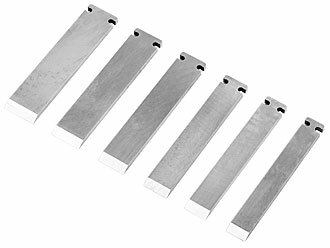 A 6.35 mm (1/4 inch) straight blade is included with the plane, and a selection of blades for grooving, rabbetting, beading, reeding, and fluting are available separately. The 45° blade bed can also hold any of the right-hand blades for the Veritas small plow plane. The position of the blade adjuster prevents left-hand-only blades (1/8 inch to 3/8 inch and 4 mm to 10 mm) from being used in this plane; however, the reversible fence lets you use the right-hand blades for both right-hand and left-hand cuts. 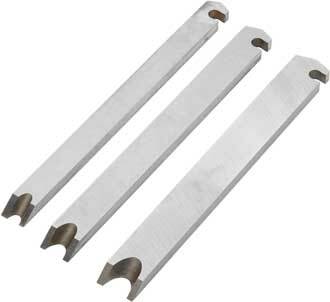 In addition to the Veritas cutters, it also accepts Record 405 and Stanley 45/55 blades. You can use the blades individually or in sequence to create a variety of decorative profiles, from simple to complex, with sizes ranging from furniture edge treatments to architectural details. A pleasure to use, the plane is 267 mm (10-1/2 inch) long and weighs 1.8 kg. Made of stress-relieved ductile iron components with brass fittings and a torrefied maple tote. 7/16 11.1 Currently not in stock! 1/2 12.7 Currently not in stock! 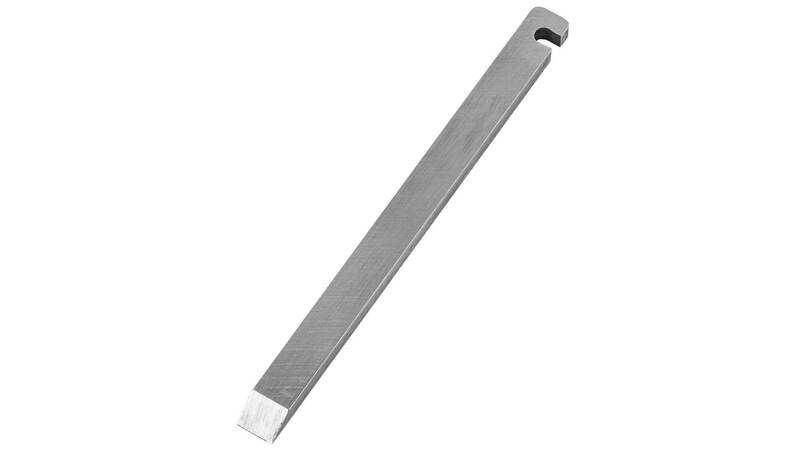 1/8 3.2 Three-Reed Blade Currently not in stock! 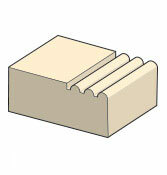 3/16 4.8 Three-Reed Blade Currently not in stock! 3/16 4.8 Currently not in stock! 3/8 9.5 Currently not in stock! 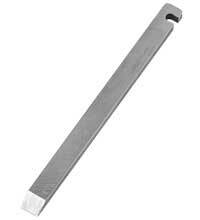 Note: 1/4 inch blade comes with plane! 5/16 7.938 Currently not in stock! 3/8 9.525 Currently not in stock! 4 Currently not in stock! 5 Currently not in stock! 6 Currently not in stock! 8 Currently not in stock! 10 Currently not in stock! 5/8 15.87 Currently not in stock! 3/4 19.05 Currently not in stock! 18 Currently not in stock! 1/8 3.18 Currently not in stock! 3/16 4.76 Currently not in stock! 1/4 6.35 Currently not in stock! 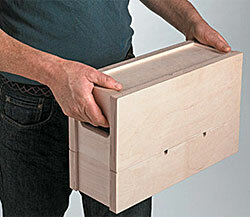 This storage box provides a place to keep the assembled plane, the second pair of fence rods and up to two blade boxes. Slots in the sides of the box base act as rests for the fence rods, holding the plane upright. 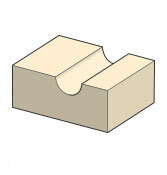 The top of the box fits into channels in the box base, locking the plane in position as well as securing other contents. 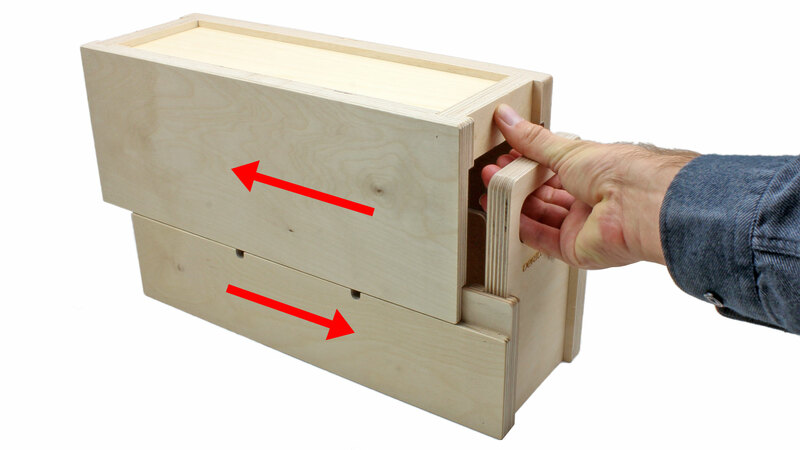 Made in Canada from Baltic birch plywood, the box is about 368 x 127 x 229 mm (14-1/2 x 5 x 9 inches) and has hand-holds on either end. 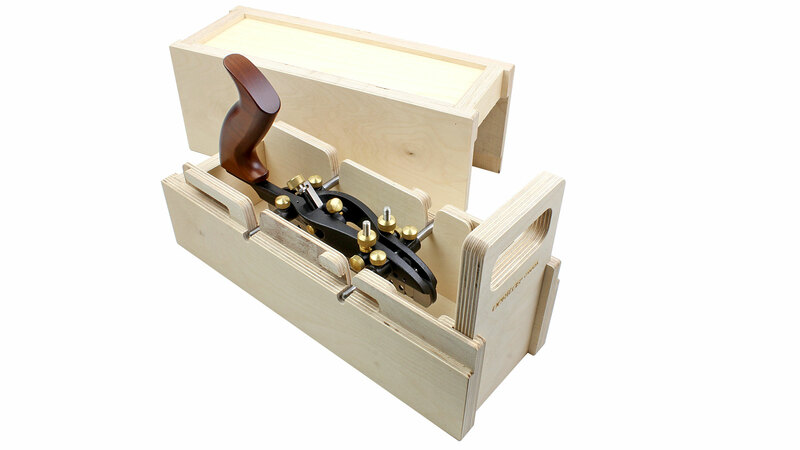 This blade box holds the blades for the combination plane or small plow plane, displaying them edge up so you can easily pick the one you need. 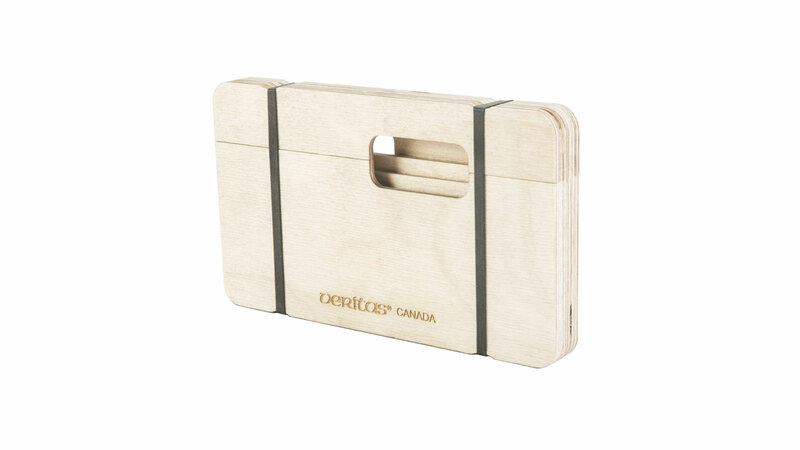 Made of Baltic birch plywood, it holds blades side by side in two 152 mm (6 inch) long rows. Because the width of the blades determines how many fit in the box, the number of blades you can store depends on which blades you own. 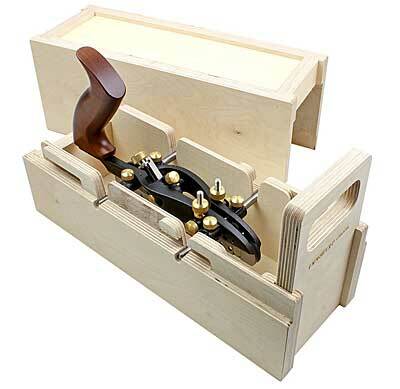 However, all the new blades for the combination plane (the four large beading blades, the four fluting blades, the eight reeding blades, and the rabbetting blade) fit in one box; a second box holds all the blades for the small plow plane, including blades that require the wide-blade conversion kit. 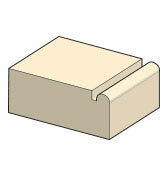 A cover protects the blades when not in use.